I wonder if we think in cartoons. Roy Lichtenstein summed up our present day succinctly. For four decades he lived his life in relative obscurity, his paintings groping in artistic gloom for the light switch. And then – kapow. His son asked him to paint a really good cartoon; and his cartoon-strip style was born. Bold, bare, ironic, stimulating; he took the world by storm. We loved watching his rise, and his exhibition at The Tate; crowds flocked to see the stark black lines, the dots. The yellow, the red, the blue. Primary colours: simple, direct, forward, sensual. Passionate, indeed. Let us look at the rose and the violet, members of the sisterhood of ancient flowers. There is nothing shy and retiring about the rose. Retiring it may be, but its smell is a siren and its absence mourned. It is a flower which speaks to the passions through one of our most basic senses. One is quite in danger of losing ones head in the presence of the rose and the violet. It could be an essay title. Discuss, why don’t you. Yet it rings true, for whilst passion has its place in driving mankind forward, there is a place for that which maintains the status quo. Something green, perhaps; those glorious Euphorbias which were adored by Vita Sackville West and which pepper her fairytale castle grounds at Sissinghurst in Kent. 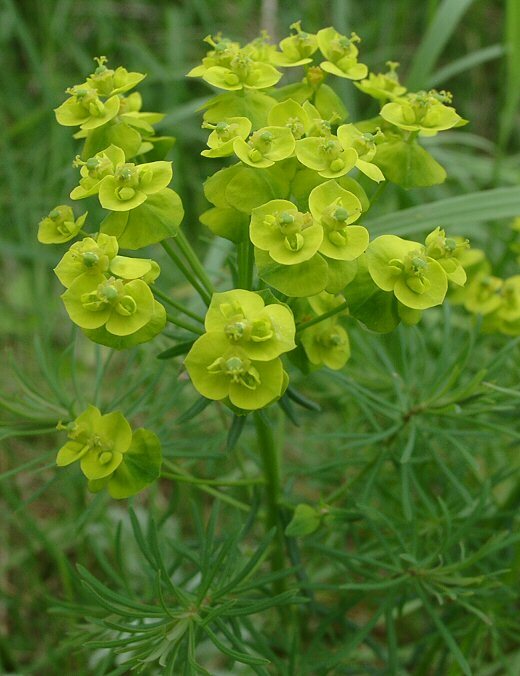 Euphorbia has no pungent, dizzying perfume. Nor does it turn the head with scarlet petals. It’s just a jolly good form. A piece of structure for the perennial flower beds. Eye catching, but with a subtle, unassuming stance. What it does, it does beautifully and it is beloved by true gardeners everywhere. But it does not stir the passions so much. Rather, it engages the intellect. But Euphorbia are a cool, stable green. And some prefer that. Do you? Written for Side View’s Weekend Theme this week: Roses are red, violets are blue. You can find details of her theme here. Posted in WhimsyTagged Edmund Spencer, roses are red, Roy Lichtenstein, side view weekend theme, violets are blueBookmark the permalink. I love the wild euphorbia that colonises my lawn. I let it have a patch and cut the grass around it. There are different kinds. Where I go,walking there is big one that grows where the cows have been and it has darker leaves and flowers the colour of cream of zucchini soup. Another euphorbia lover, Jason, excellent! love the idea of leaving a patch of them growing on your lawn. How beautiful. What a wonderful, real KATE-TOUR. Thank you so much. I agree completely. Sidey. WE cannot be driven all the time, can we? You are welcome, thanks for the theme! The black and white of the snow scene outside my window has drained any thoughts of colour from mind. It does that, Roger, doesn’t it? Snow makes me want to stop doing anything at all. The antithesis of passion. A tour de force on the subject! Of course, some of the Euphorbias seen here are quite passionate in what they do – take pulcherrima – the Poinsettia – for example! Indis-Spencer-bill ineed 🙂 Is the poinsetia in the same family? Gracious – couldn’t get much more passionate than that, could we? That family is bewilderingly varied in the nature of the plants it includes. 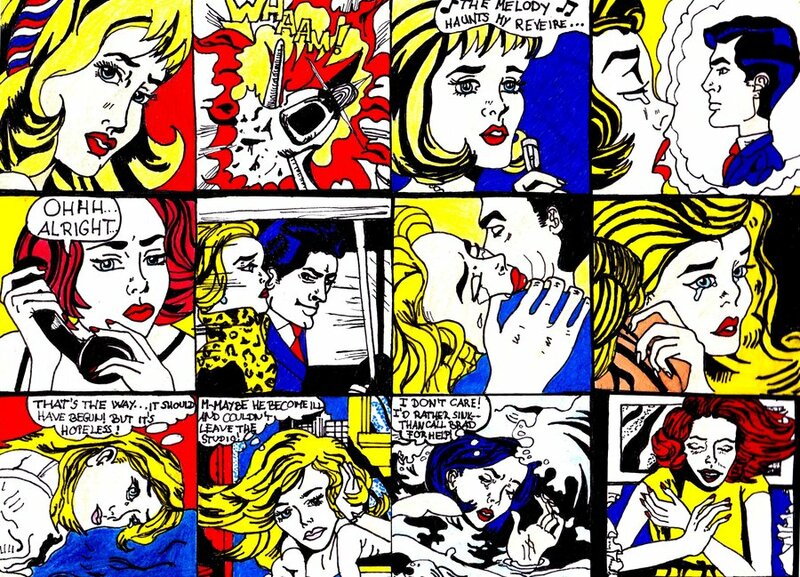 I have never understood the appeal of Roy Lichtenstein: yet I have heard that the exhibition is engaging and revealing, so should probably give it a chance! I feel we need both the huge variety that the euphorbia family offers – variety that is in form and structure, (as well as toxicity – the sap in Africa can be used as a dart poison) – and the colour and scent of other flowers, such as roses. Variety is, after all, the spice of life. I love to place these “cool” colors around the garden; they “pop” on dark days and I find them as stimulated to the senses as the red rose and blue violet (though violets have a special place in my heart for my mom’s name was Violet). Ah, Kate, your post has me yearning all-the-more now for spring, which is still far away. Alas, even when the Spring arrives, Penny, we still have the rain to contend with. The last few years have been a washout for our gardens. We are crossing our fingers for a warm dry Summer; only then can we reclaim them. For me, I love the more vibrant, passionate colours – I am Aries after all. Brilliant post and thanks for including that beautiful choral rendition by one of my favourite choirs. It is an incredibly stirring performance, isn’t it, Ruth? One of my favourite pieces. All of his carols cut my heart to the quick. One of the things I love about England is the dizzying variety of flora. We may have sunny days in winter, and we may have flowers when others do not, but we are very limited in what we CAN grow because of the climate. I will take a riot of all of this with some fuchsia thrown in, and love it passionately. Ah, fuschia, those little scarlet and indigo ballerinas! Wonderful flowers, Andra, as passionate as they come. Wonderful take on the theme. I love deep dark violet violets and all manner of yellow flowers, . . . but that Euphorbia is lovely! It is, isn’t it, Nancy? If you ever visit Kent the euphorbias of Sissinghurst are a must. The rose and the violet are two of my favorite flowers, Kate. Every year the Polish couple that maintain my brownstone plant roses in the garden. I love it when those flowers bloom, not to imply that a patch of garden the size of a welcome mat in Gotham City has anything on the gardens in jolly old England. The rose is peerless in that respect, Lame. It has flare, and syle, and perfume. What imagination the people of your brownstone have. I do. I think the greens ‘ground’ the vibrant colours in nature. Guess that is the balance you are referring to….imagine a garden with all colour and no green! Madhu, you have hit the nail on the head. The green ‘earths’ the passionate colours. I love it. Walt Disney had an interesting take on violets in his cartoons. They were far from “shrinking.” Myself, I love poppies and regret that I cannot grow them in Florida because it’s far too hot here. I used to have them in our garden in Central New York.